REVOLVE is the virtual home for an unrivaled collection of over 500 of the world's most-coveted brands in men's and women's designer apparel, shoes, and accessories. As an innovative online-only retailer, REVOLVE constantly strives to provide the most relevant digital experience possible to engage customers and keep them coming back for more. Founded in 2003, the company has seen enormous success thus far – with $400 million in annual sales in 2015 and 50% year-over-year growth since 2012. But as the company expands, one of its biggest challenges is to ensure that its digital experience still feels relevant, curated, and engaging. This is where data, analysis, and optimization is mission-critical. REVOLVE’s early success came from using data and search terms to determine how to grow and expand the business. These insights helped the company predict trends and catch-on early to what online shoppers were looking for. According to Grace Hong, REVOLVE’s VP of Product and Design, the company’s optimization program was a natural extension of this analytical expertise. Now, a strategy of continuous testing and optimization helps REVOLVE keep pace with the ever-changing behavior of shoppers on its desktop site, mobile website, and mobile app. Optimization helps REVOLVE improve its digital experiences and deliver the most relevant content possible that resonates with shoppers. In the highly competitive landscape of online retail, this gives the company a huge advantage. If our customer doesn’t see the perfect dress for her on the first page she visits, she’s likely to move on to the next app or site vying for her attention. It’s absolutely necessary to show her what she wants as soon as she comes to us - even if she doesn’t yet know what that item is. Through optimization, REVOLVE has found more effective ways to pique shoppers’ interest upfront in order to turn more browsers into buyers and decrease bounce rates to competing sites. One experiment REVOLVE ran that highlights this principle was a test on their desktop site navigation. REVOLVE’s “Hot List” page helps visitors find and shop the most recent, popular styles in an curated manner. The “Hot List” an easy hook for shoppers who aren’t necessarily on the hunt for a particular item. Plus, the page is a top performer for REVOLVE, with a relatively high conversion to purchase rate for shoppers who are just browsing on REVOLVE’s site. The team hypothesized that repositioning the “Hot List” to the front of the navigation menu would encourage more visitors to shop the page, and thus increase purchase conversion rate. The success metrics for the test were engagement, bounce rate, and purchase conversion. REVOLVE ran a test on the navigation bar on its website. Moving the “Hot List” to the front of the desktop navigation increased engagement with the page by 20%, ultimately converting significant number of would-be-browsers to buyers and decreasing the number of shoppers who bounced to competing sites. Turning browsers into buyers isn’t REVOLVE’s only challenge. Once customers make that initial purchase, they also want to ensure they come back for more. One channel the REVOLVE team has found particularly effective in driving customer lifetime value and loyalty is email marketing. The company has more than 1.5 million loyal email subscribers across its family of brands. We have had great success with customers who come check the site out every day based on email marketing. Despite the trope that ‘email is dead,’ we know our customer base loves getting REVOLVE emails daily – when they are carefully curated and on-brand. REVOLVE’s sister site, luxury retailer FORWARD by Elyse Walker, uses A/B testing to drive more sign-ups to this high impact marketing channel – most recently, optimizing the email capture process. The FORWARD team tested two different options to increase email sign-ups. 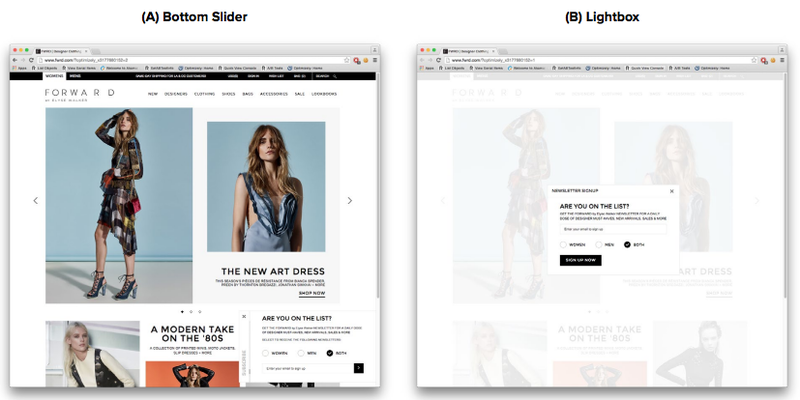 The lightbox variation increased total email sign-ups by 2.25%, compared to the more subtle bottom-slider pop-up. REVOLVE ran a test to increase email sign-ups. With more shoppers signed up for their highly effective email marketing campaigns, FORWARD is better poised to drive more value from more customers over time. REVOLVE customers are always on the go, so we’ve been doubling down on how to reach her where she is in her element: mobile. Last year, 50 percent of site traffic came from our mobile site. We also just launched our Android app in October and released our iPad app last month, to add to our existing iPhone app. While traffic to their mobile website is high, one of REVOLVE’s key business goals for 2016 is to drive more app usage. So far, total app downloads have increased 80% since the start of this quarter. When a visitor shops directly from the app, REVOLVE can better provide relevant, personalized experiences, notifications, and offers, with a much lower chance of shoppers becoming distracted or bouncing to a competing site. Mobile isn’t going away anytime soon, so being able to fine-tune and personalize the mobile experience is an ongoing challenge. In order to better fine-tune the experiences they provide mobile shoppers, the REVOLVE team recently ran a test to increase the number of shoppers using their mobile app. 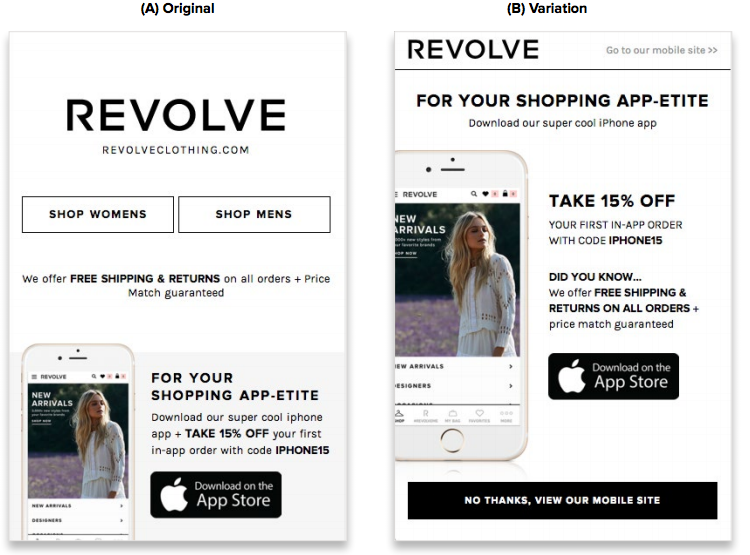 They hypothesized that directing mobile web visitors to a splash page with aggressive promotion for REVOLVE’s mobile app would drive more app installs. They measured bounce rates and app downloads as key success metrics. REVOLVE ran a test to increase the number of mobile app downloads. The variation with the aggressive splash page increased app downloads directly from the mobile site by an overwhelming 350%. With more users shopping from the mobile app, REVOLVE can better provide relevant, personalized experiences to drive more purchases.